GadgetMadness Portable printer. REALLY portable printer. Portable printer. REALLY portable printer. And I thought my BJC-50 was small. This new printer is so innovative it makes me want to waste dead trees just to see it working. cool design but no sheet feed one page at a time? Have a look at the ultra-portable printers currently on the market. They don’t have sheet feeders either. The Worlds Most Portable Circular Printer? 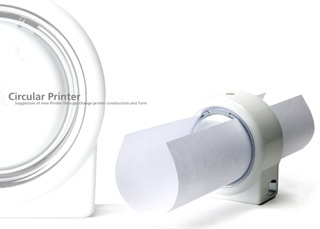 Recently the IDSA has awarded engineers at Samsung for creating the first ever circular printer. The unit, looks like a cupholder and is much more manageable to take with you or even install in a vehicle perhaps?